Dirty Girl Mud Run. Check. Last Saturday, I participated in and finished my first mud run. It was awesome, amazing, dirty – and I loved every minute of it! I was on a team with four other women, appropriately named Mudlife Crisis! This picture is so representative of the past year for me. A number of phrases and metaphors come to mind when I look at it: “one step at a time,” “no pain, no gain,” “do the impossible,” “every rose has it’s thorn,” “look toward the future,” “reach for the stars,” “one day at a time” just to name a few. But, really, that smile says it all – a sense of accomplishment. I haven’t always been good at following through with things. I’m a big idea person. I’ve accomplished some great things in my life, but I’ve had even greater ideas. And, when I was drinking I had REALLY good ideas and intentions. At one point, I was going to start a business, sell jewelry, sell makeup, sew all my own clothes (seriously), raise chickens, get my real estate license, get certified to be a fitness trainer, start blogs, stop blogs and the list goes on. I would plan parties and cancel them; I would schedule lunches and dinners and back out at the last minute; I would commit myself to something and then find a reason I couldn’t do it. And, I did all of these things with no regard to how it affected others. Me, me, me – that’s all I thought about. I’m far from a saint these days, but I do my very best to follow through with what I say I’m going to do. You would think it’s pretty simple, but for someone like me it takes discipline. And, it also requires learning to say “No.” Learning to be responsible and take control of my life has been consequential to my recovery. I can’t do it all and I can’t always make everyone happy, but I can show up and do my best. 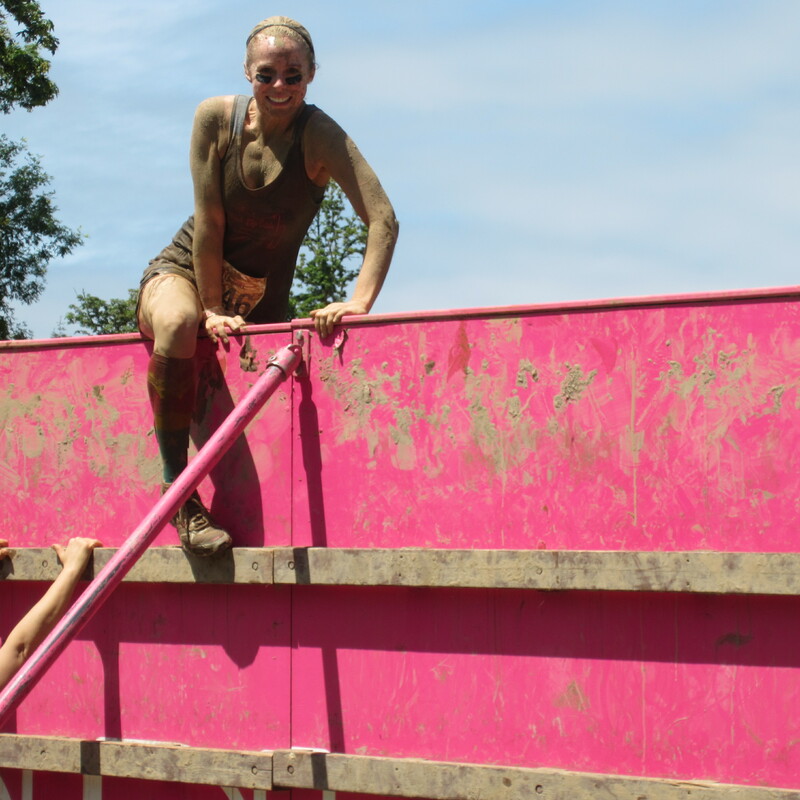 This past weekend, I showed up and got really dirty in the process – and it was great! Your transparency is refreshing! I love the pic! Ur smile is awesome! I love that you’ve noticed your pitfalls & are now working to be better that u were b4! I love your BIG ideas, dreams, goals! The bigger the better! Set your intentions & watch them all unfold! I can identify with the grand schemes – how many late night or booze session ideas were scrawled on stained napkins or coasters only to be unidentifiable and/or ridiculous in the light of day. We want the world to judge us on our intentions, but ultimately we are judged on our actions. And your actions these days are wonderful – laying and sticking to boundaries, being where you say you will be when you say you will be, etc. That’s living, that’s what “normal” people do. Oy vey – how did it take us so long just to get here? But we expand past that, our spiritual lives grow, we see new life in our life and we do things like…mud running. Lol, Paul! I should have posted pics of all of us girls spraying each other off at the end! I could’ve made some money off of those! I love how you mentioned what “normal” people do. I know, what a concept – actually, doing what you say you’re going to do! Thanks for the insight! Congratulations on your first mud run! I relate to what you’re saying about not following through with things while you were drinking. I was the same way. I had so many ideas and desires bursting out of me but I could never quite get out of my head. One of the greatest things about being sober for me is saying yes to things I wouldn’t have done before (mostly because alcohol wouldn’t be involved). Your smile really does say it all! Yay for you!!! I love the photo! How symbolic, indeed. I too was a major flit, especially while drinking, even today to a degree. I tend to bore easily, or so I tell myself. But sticking to a goal, to a plan, following through even when I may want to do something else, is so rewarding. So proud of you! Thanks! It was so much fun! Now, I want to do another one! Thanks so much! Yes, realistic goals are the key for me too. My husband and I have a deal now. If I come up with an idea, I need to think about it for a month until I take action. It’s really helped because so often my grand ideas dissipate within a few days! Great photo. What a stud. I love the energy in this post. Teaching us all what we can do when we get the focus in the direction of achieving, regardless of the obstacles. Mom, wife, writer, aspiring DIYer and seeker of simplicity. I write about faith, food, family, sobriety and life on our small Oregon farm. My writing comes from my heart, transparent and honest, just as I aim to live my life today. In sharing my story, I hope you find inspiration to live your most authentic and joyful life. Thanks for stopping by! © Life Corked 2018. All rights reserved. No part of this website or any of its contents may be reproduced, copied, modified or adapted, without the prior written consent of the author, unless otherwise indicated for stand-alone materials. You may share this website by any of the following means: 1. Using any of the share icons at the bottom of each page; 2. Providing a back-link or the URL of the content you wish to disseminate; and 3. You may quote extracts from the website with attribution to www.lifecorked.com. Commercial use and distribution of the contents of the website is not allowed without express and prior written consent of the author.